There are no coronal holes on the Earth-facing side of the sun today. Credit: SOHO Extreme UV telescope. NEW SUNSPOT: A new sunspot is emerging near the sun's eastern limb, and it might be a big one. "I can't wait to see what this one brings," says Greg Piepol who took this picture just hours ago. HAVING A BALL: Last night when the full Moon rose over the beach at Treguennec, France, graphic artist Sabine was struck by an overpowering thought: "What a great beach ball!" Photographer Laurent Laveder caught her rolling, tossing and even kicking the Moon. Who said astronomy's no fun? "For months, Sabine and I have been talking about playing with the Moon in this way," says Laveder. "And we have many more ideas." 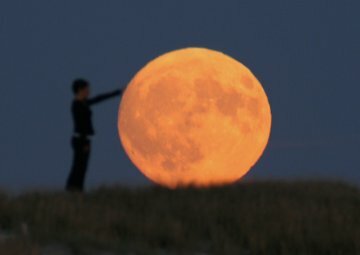 The next full Moon: Sept. 7th. Stay tuned. DAWN PLANETS: Up at dawn? Step outside and look east. 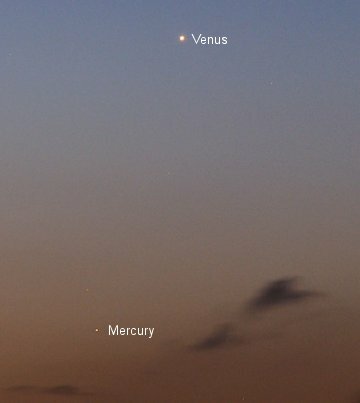 You'll see Venus and Mercury beaming through the rosy glow of sunrise: sky map. Above: "Here they are rising out of the Irish Sea on the morning of August 9th," says photographer Paul Evans of Larne, Co Antrim, Northern Ireland. "I'll be keeping an eye on them as they get even closer together over the next few days."